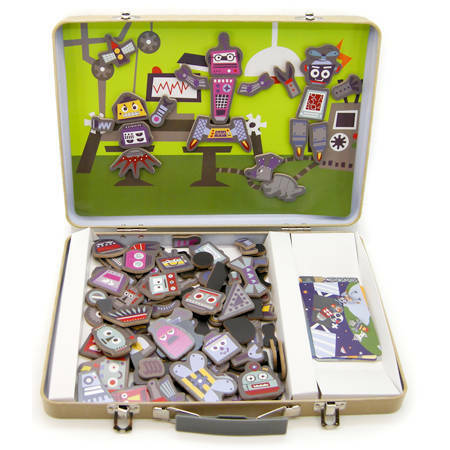 Magnetic Robot Factory Tin Case is a wonderfully creative mix and match toy where you create different scenes on beautiful full coloured backgrounds. This set comes with 140 magnetic pieces made from wood with sheet magnet, the size of the piece, bonded to the back, 6 scenery cards A4 size and 6 character cards with ideas for your scenes. To use the toy you place the scene you want to build on on a magnetic surface, the tin box lid or the fridge perhaps, and then start adding all your robots pieces. What you create is up to you and with 140 pieces the possibilities are almost endless. Packing up is easy as everything fits nicely into the tin carry case. Size: Case is 30.5cm long x 22.5cm wide x 4.5cm high. We like this because: "Very well thought out, easy to keep together, lots and lots of possibilities"